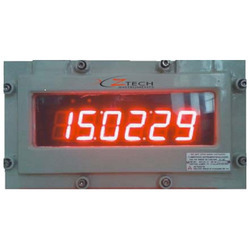 - Size ;2" , 4" , 8"
We have gained expertise in delivering Digital Clock to the customers. These are made using quality raw material following industry standards. Owing to the features such as accuracy, low maintenance cost and longer life, these clocks are widely applauded in this competitive market. - Range : 999 sec. - Resolution : 0. 1 sec. - Hour , Minute - 1.8"
Premium USB clock made of actual wood! - In-built Real Time Clock Chip. - Battery back up for RTC. These clocks are designed to be used in industries or common waiting halls like Airports, Railway Stations, Hospitals etc.It uses 4 digits of six inch seven segment displays with super bright LEDs (each segment is made of 4 pixels with 4 LEDs in every pixel). - Operates either in 12hrs mode or 24hrs mode.